As a teenager I was fascinated by history, and art. My first introduction to early music proper ofcourse was via a Munrow record. 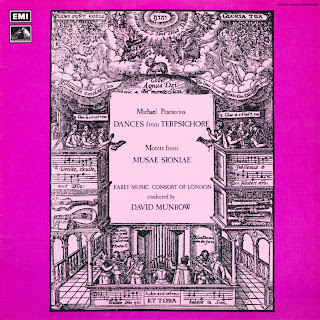 In the early 70s his Early Music Consort dominated the scene unlike now where there are any number of ensembles dealing with medieval, and renaissance music such as Piffaro, the Clemencic Consort, the Orlando Consort, Gothic Voices, et al. Anyway, on occassion I would listen to Pied Piper on the radio especially when it dealt with early music. I notably recall the Feast of the Pheasant which drew its musical extracts from Munrows own record album of The Art of Courtly Love album notably dealing with Machaut, and Dufay. It was clear that he used his own printed "notes" from this recording for this specific broadcast. I seem to recall too a broadcast on Pied Piper of his Se La Face Ay Pale by Dufay. He referred to it as being "rich, and expressive." Munrows voice seem to shake when he mentioned that Dufay died in 1474. One Pied Piper programme I was not too impressed in was concerned with "primitive" African music. Infact, the whole thing was virtually all "music"with little imput from Munrow himself. On another occassion, I recall at the end of a Pied Piper programme a short interview with Kenneth Clarke who wrote, and presented the classic BBC tv programme Civilization. At the end of it, Munrow asked his guest to select a piece of music, and sniggered when Clarke revealed what he wanted which was a sort of an odd loud discordant a cappella work from renaissance Italy if I recall correctly. Pied Piper has been repeated on rare occassions notably in 1982 (the same year in the which The Art of David Munrow appeared). I remember hearing On with the Dance. In one programme I was introduced for the first time to the Capriol Suite by Peter Warlock, a splendid work. At one point, I recall Munrow reading a piece from some renaissance treastise in which one dancer warned others of the possibility of a "...disagreeable odour." when in very close proximity. The way Munrow expressed "...a disagreeable odour.." was frankly unforgetable. But ofcourse he used to put a alot of expression into his speaking especially when it was felt necessary for effect. Apparently, Pied Piper used to run the odd competition but I do not remember hearing any of them. I do recall hearing a live consort from the Albert Hall, and notably a somewhat discordant interpretation of Helas Madame...unforgetable! PS Referring to Jazz Munrow said on Pied Piper "....that was another story." I suspect he probably covered this subject as he loved Jazz.